After nearly a decade of failed & mediocre attempts to make pizza, the last 12 years, our family has been enjoying homemade pizza that we literally crave and have only found close seconds at restaurants. The secret? It’s not letting your dough rise all day. It’s not simmering homemade sauce for hours. It’s not even the type of cheese you use. 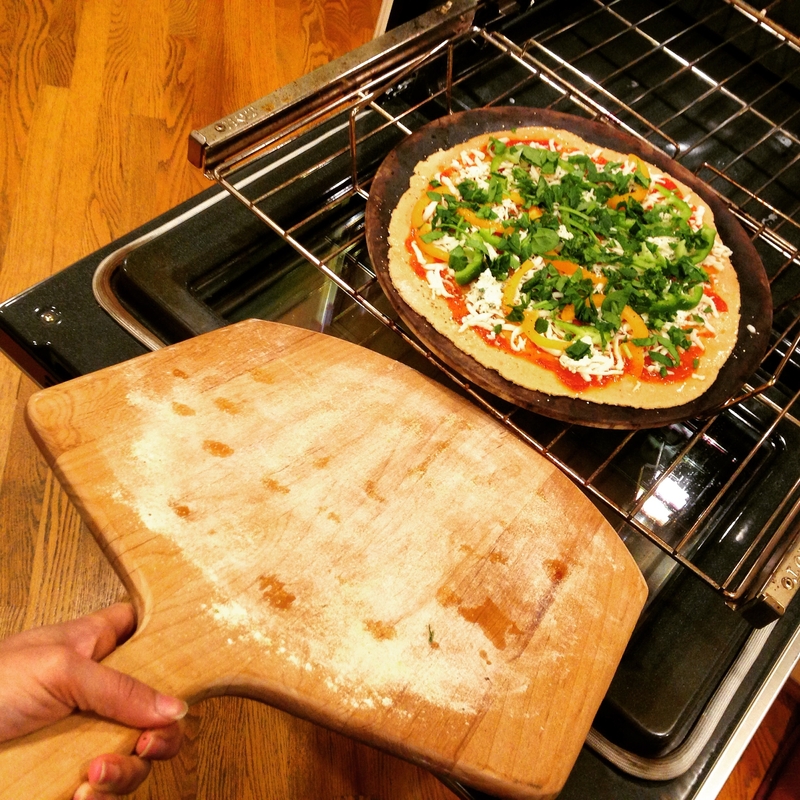 It’s investing in a pizza stone (doesn’t have to be a Pampered Chef one either!) and PRE-heating your oven to 500 DEGREES! I don’t know why so many of us heat it anywhere from only 375-425 degrees and then bake for a half hour or longer. Use this recipe/method below and I promise you an unforgettable pie of pizza that is the perfect balance of crisp & chewy after baking for only 8-10 minutes! If it feels like I’m yelling at you, I probably am…sorry, this type of thing gets me passionately excited 🙂 . I start with water that is hot to the touch but bearable to keep my finger in. I’ve used rapid and regular yeast and “feed” it with sugar or honey most commonly. Whole wheat pastry flour works just like white flour and a wooden spoon mixes and gathers the dough well. This is my special board just for rolling out pizza and pie crusts. 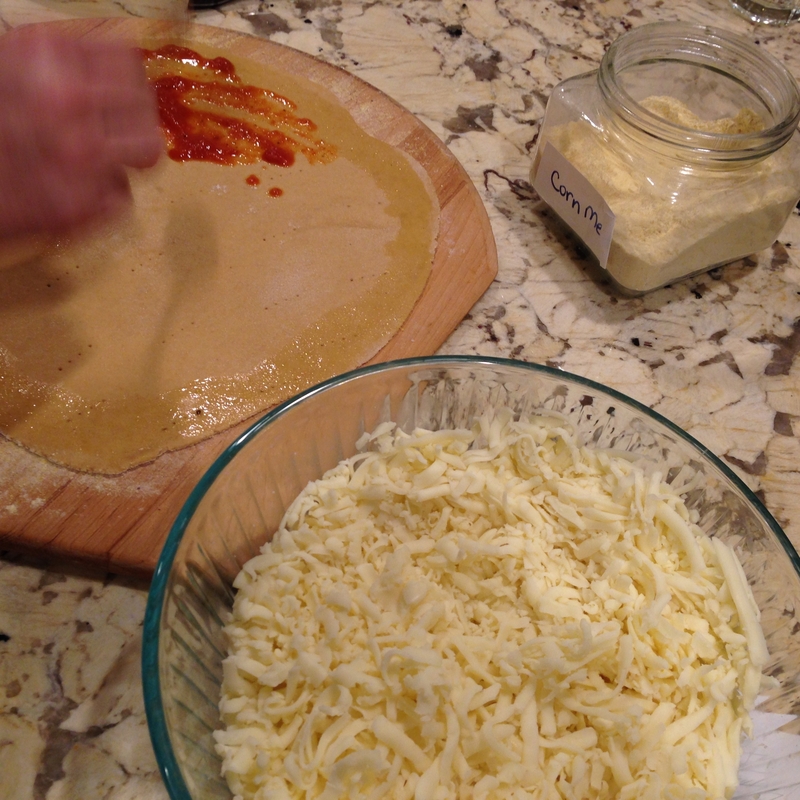 Using cornmeal is the magic trick which helps to transfer the prepared pizza into the oven. Having a pizza peel and pizza stone are key. Even if you make this pizza a couple of times a year, those 2 pieces of equipment are totally worth it. The stone stores on the top rack of my oven all of the time and never affects anything else I bake. 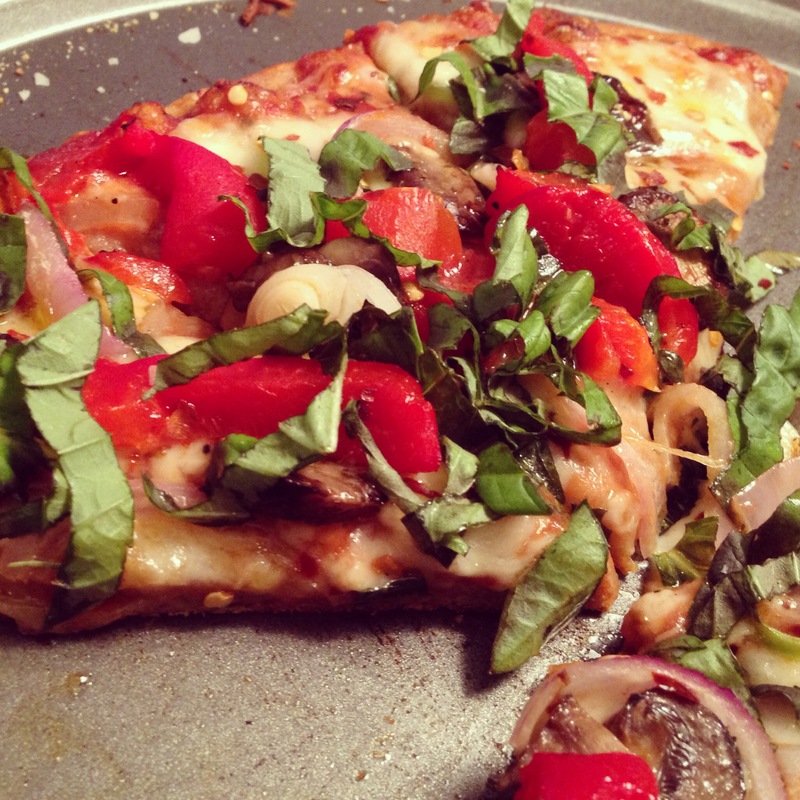 It allows for quick and even cooking and the pizza stays piping hot much longer. The peel makes the transfer to the oven so smooth. *Please see my Amazon store for deals on pizza stones and peels; nothing is marked up from Amazon’s original price. I generally roll the dough out to 1/4 inch thickness and it holds any amount of toppings and cooks through wonderfully. Thin crusted and just plain delicious. Add fresh or dried herbs at the end to for extra yumminess! 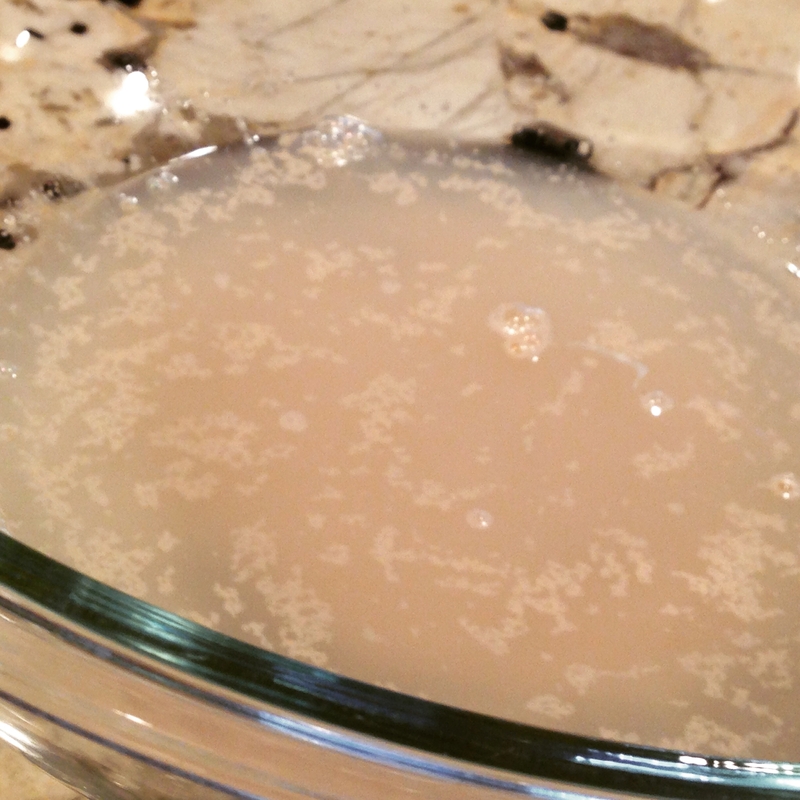 Pour 1 cup of warm (not too hot or your yeast will croak instead of float) into a mixing bowl. Add 1 packet of any rapid rise yeast. Add sweetener which feeds the yeast. Wait 5 min. or until you can smell the yeast & see it foaming a bit. Add flour, salt, and olive oil. Mix with a wooden spoon (it’s will stick to the spoon some so don’t worry), adding flour as needed to get the right consistency. Once it is pretty well gathered, toss that spoon into the sink, & continue kneading with your hands – again adding flour as needed. Within minutes, you will have kneaded dough that looks like you stole it from Emeril. Round it out, flatten into a thick disk, & curve the edge underneath so the top is dome like & underneath it looks kind of like the folds of a bellybutton (sorry I pondered a long time how to describe this). Then put the dough into a clean, olive oiled bowl. Cover dough (not the mouth of the bowl) loosely with plastic wrap & place into your unheated oven or other dark place. 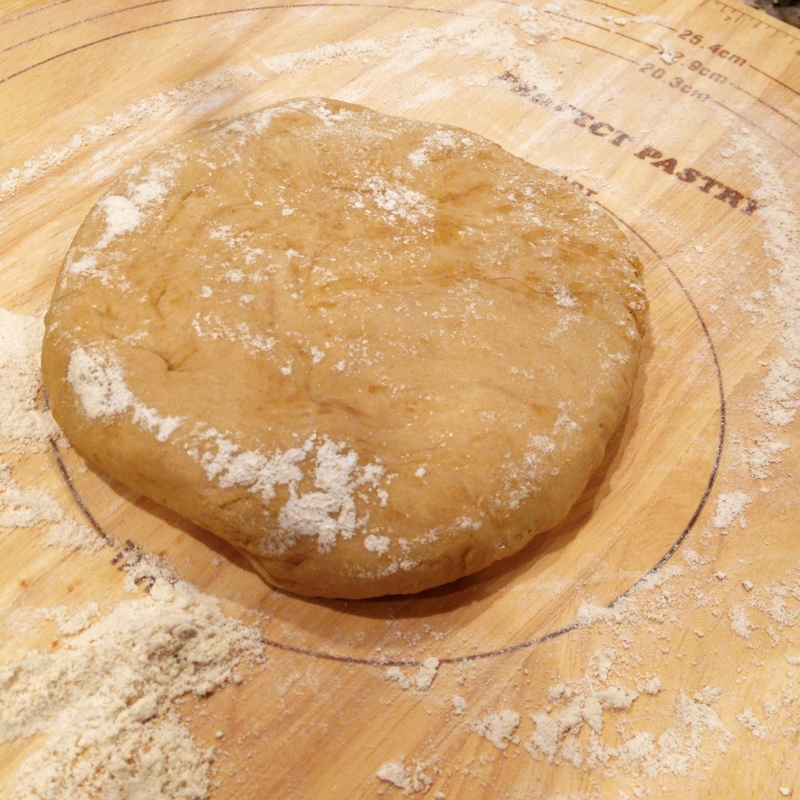 Now ideally you would wait 1 hour, re-knead & re-dome it, and then let rise for 1 more hour. Realistically (& impatiently like me), you can just let it rise for 1 hr. And in a pinch, you don’t even have to let it rise (it just won’t have as airy a texture inside). Preheat oven to 500 degrees with stone in oven. Once all that rising business is done, put dough on a floured surface. Knead for a couple minutes then roll into as even a log you can. Cut in half. Keep half on floured surface and put the other half back in the oiled bowl. Roll out, adding enough flour to avoid sticking to surface, into approx. a 14 inch pie (larger if you want it thinner, smaller if you want it thicker). Sprinkle & spread some corn meal generously enough to cover the surface of a pizza peel. If you don’t have a pizza peel, you can use the bottom of a pizza pan. Then pick up (it won’t break thanks to all your kneading making the gluten party) the rolled out dough & place on your corn meal sprinkled medium. Brush olive oil around the top edge of the pie, careful not to let it drip down the sides or underneath (but if that happens, lift up the insulted area & re-sprinkle corn meal right under it). Fill the remaining middle area with your choice of sauce. Add toppings and shredded cheese (either order), and finally, a swirl of olive oil on top – this is what keeps your cheese from burning. Slide onto the preheated pizza stone in the oven with a little help from a spatula (so easy thanks to the cornmeal but almost too easy so careful not to let it slide over the back edge of the stone!). Set timer for 10 min. Sometimes I do 10 min. for the 1st pizza and 8 for the 2nd. Turn on the oven light & watch the magic. When the pizza is done, slide peel under pizza & place onto a pizza pan or slide onto a pizza pan very carefully if you don’t have a pizza peel. The peels are great b/c they have a long handle & are a klutz-proof way to pick up the pizza for someone like me! Repeat with 2nd half of dough. Cut into slices & ENJOY. I know this seems tedious but that’s just because I’m wordy. After some experience, it now takes me 10 minutes to make the dough. 10-15 min. to roll out and top each pie & then about 10 min. to bake each pie. So it’s really under 1 hour!! You are welcome! We can eat a lot of it too! 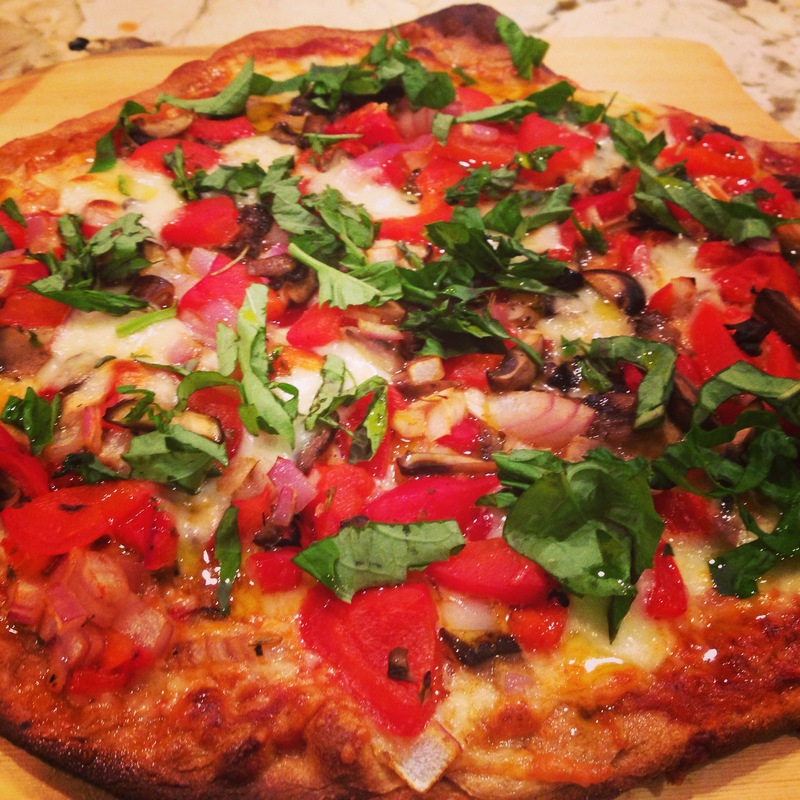 I’ve been lucky enough to experience Rajul’s pizza recipe and I have to say–it is the best! 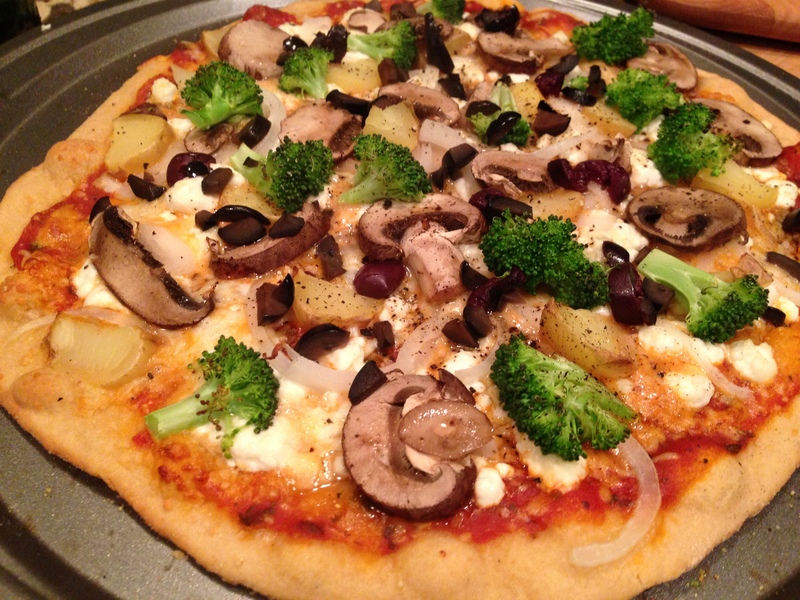 Healthy, delicious, fast…and if she makes a mushroom one for me, it’s gone in a flash. So nice of you to say, thank you!! That is a good reason Julie! I have a feeling Santa will come through for you! 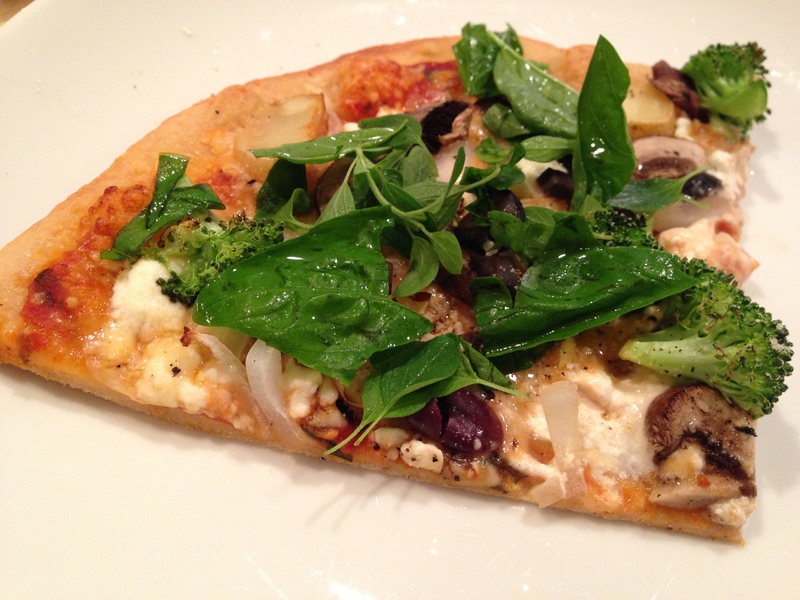 Having eaten this pizza, I now need to actually try making it! Healthy, delicious, tried and tested, can’t go wrong! Can’t wait to try it out! Best home made pizza ever! I ❤️ It! Fresh & delicious. I’m so happy you liked it! We enjoy the freshness too.